To realize Ghana’s full economic transformation, our road network needs to be second to none. The Tarkwa-Nsuaem Municipality has begun rolling out the Planting for Export and Rural Development Programme (PERD). Two bodies have joined a media pressure against the government over suspicions it plans to hand over Ghana's Digital Terrestrial Television infrastructure to a Chinese firm, StarTimes. The Media Coalition against Open Defecation (M-CODe) has called on President Akufo-Addo to declare a target date to end open defecation in Ghana. The Ministry of Youth and Sports (MOYS) has inaugurated a nine-member National Anti-Doping Committee (NADC) tasked with producing a legal framework that will lead to the establishment of an independent national anti-doping commission. A Deputy Minister of Information, Mr Pius Enam Hadzide has stated that government will continue to implement policies that will transform the fortunes of the country. 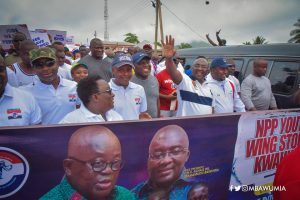 Persons hoping to vie for various portfolios in the race to lead the largest opposition party NDC will know their fate after Sunday, September 23, 2018. Gaming, especially online betting here in Ghana may have given lovers of the game their own down times, but Betyetu is righting the wrongs and re-writing the story. On Tuesday, September 18, representatives from the governments of the United States of America and Ghana participated in the 4th Security Governance Initiative (SGI) Steering Committee Meeting at the Marriott Hotel in Accra. Dancehall act Emmanuel Andrews Samini, popularly known as Samini, has taken a swipe at the incumbent government for neglecting the needs of those living in the Northern regions of Ghana. Hello good evening welcome to the 2nd day of the 2018/2019 UEFA Champions League. Pressure is mounting on maverick football administrator Takyi Arhin, known in football circles as ‘Thunder’, to retract and apologise for his sexist comments made against two members of the FIFA Normalization Committee. Founder of the African University College of Communications (AUCC), Kojo Yankah, fears the Sinohydro agreement between Ghana and China may culminate in Ghana losing the entire Atewa forest to China. National Democratic Congress (NDC) flag bearer-hopeful, Alban Bagbin, has said “after we have won the 2020” general elections, “we are not going to show Nana, as people say; we will pay back in the same coin”, what the New Patriotic Party “did to us in 2016”. The Minority in Parliament is demanding the scrapping of the special petroleum tax as a measure to cushion Ghanaians as the prices of petroleum products keep rising.